INTRODUCTION: Gastrointestinal tract duplications are rare malformations that can affect any segment of the gastrointestinal tract, although half of the cases occur in the ileum. They are divided into cystic and tubular and can be either adjacent or completely separated from the intestine.As we have had the opportunity to diagnose a patient with this issue and because of its rarity we judged well to report it. 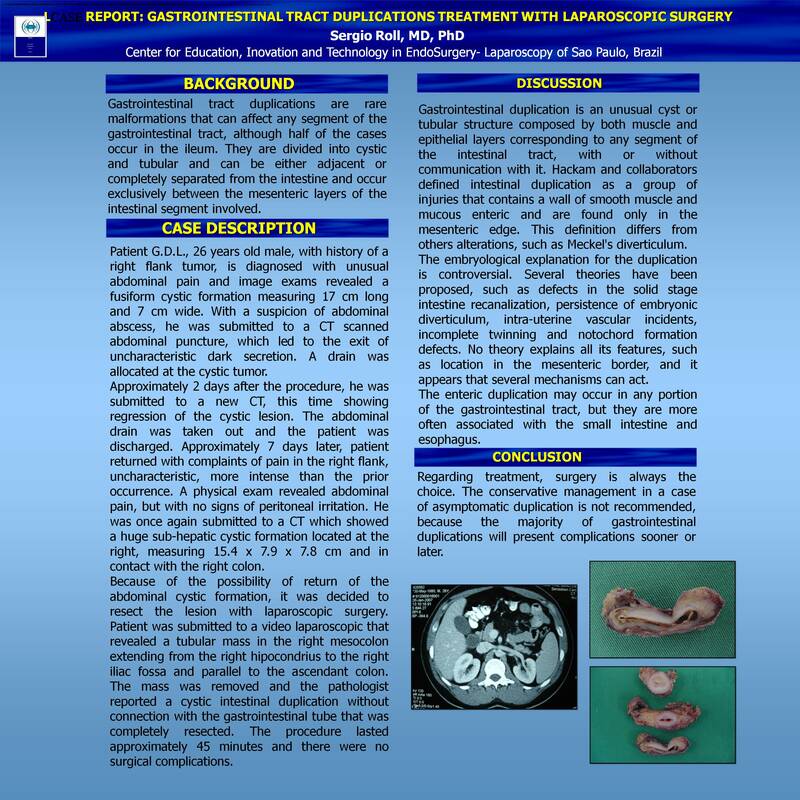 CASE DESCRIPTION: Patient G.D.L., 26 years old male, with history of a right flank tumor, is diagnosed with unusual abdominal pain and image exams revealed a fusiform cystic formation measuring17 cm long and 7 cm wide. With a suspicion of abdominal abscess, he was submitted to a computer-tomographyscanned abdominal puncture, which led to the exit of uncharacteristic dark secretion. A drain was allocated at the cystic tumor. Approximately 2 days after the procedure, he was submitted to a new CT, this time showing regression of the cystic lesion. The abdominal drain was taken out and the patient was discharged.Sevendays later, patient returned with complaints of pain in the right flank,more intense than the prior occurrence and with progressive worsening from two days to now. Theexam revealed abdominal pain, but with no signs of peritoneal irritation. He was once again submitted to a CT which showed a huge sub-hepatic cystic formation located at the right, measuring 15.4 x 7.9 x 7.8 cm and in contact with the right colon. Because of the possibility of return of the abdominal cystic formation, we decided to resect the lesion with laparoscopic surgery. The surgeryrevealed a tubular mass in the right mesocolon extending from the right hipocondrius to the right iliac fossa and parallel to the ascendant colon. The mass was removed and the pathologist reported a cystic intestinal duplication without connection with the gastrointestinal tube that was completely resected. The procedure lasted approximately 45 minutes and there were no surgical complications. DISCUSSION: Gastrointestinal duplication is an unusual cyst or tubular structure composed by both muscle and epithelial layers corresponding to any segment of the intestinal tract, with or without communication with it. Hackam and collaborators defined intestinal duplication as a group of injuries that contains a wall of smooth muscle and mucous enteric and are found only in the mesenteric edge.The embryological explanation for the duplication is controversial. Several theories have been proposed, such as defects in the solid stage intestine recanalization, persistence of embryonic diverticulum, intra-uterine vascular incidents, incomplete twinning and notochord formation defects. No theory explains all its features, such as location in the mesenteric border, and it appears that several mechanisms can act. The enteric duplication may occur in any portion of the gastrointestinal tract, but they are more often associated with the small intestine and esophagus. Regarding treatment, surgery isthe choice. The conservative management in a case of asymptomatic duplication is not recommended, because the majoritywill present complications sooner or later.